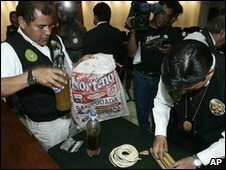 Four people have been arrested in Peru on suspicion of killing dozens of people in order to sell their fat and tissue for cosmetic uses in Europe. The gang allegedly targeted people on remote roads, luring them with fake job offers before killing them and extracting their fat. The liquidised product fetched $15,000 (£9,000) a litre and police suspect it was sold on to companies in Europe. At least five other suspects, including two Italian nationals, remain at large. Police said the gang could be behind the disappearances of up to 60 people in Peru's Huanuco and Pasco regions. One of those arrested told police the ringleader had been killing people for their fat for more than three decades. The gang has been referred to as the Pishtacos, after an ancient Peruvian legend of killers who attack people on lonely roads and murder them for their fat. At a news conference in the capital, police showed reporters two bottles containing human body fat and images of one of the alleged victims. One of the alleged killings is reported to have taken place in mid-September, with the person's body tissue removed for sale. Cmdr Angel Toledo told Reuters news agency some of the suspects had "declared and stated how they murdered people with the aim being to extract their fat in rudimentary labs and sell it". Police said they suspect the fat was sold to cosmetics and pharmaceutical companies in Europe, but have not confirmed any such connection. Human fat is used in modern cosmetic procedures but in most cases it is the patient's own fat that is used and under strict legal guidelines. Medical authorities have expressed scepticism about a black market for human fat, partly because of the wide availability of fat for use in surgical procedures. Gen Felix Burga, head of Peru's police criminal division, said there were indications that "an international network trafficking human fat" was operating from Peru. The first person was arrested earlier this month in a bus station in Lima, carrying a shipment of the fat. The Associated Press news agency quoted Col Jorge Mejia as saying one of the suspects had described to police in detail how the victims were killed and their fat removed. The suspect said the fat was then sold to intermediaries in Lima and that the gang's leader, Hilario Cudena, had been carrying out such murders for decades, AP reported. The alleged buyers of the fat are also being hunted by police.